Scott Noble is requesting funds. Go here and click 'donate' to send him money to help him make further films. Download Hour1 Download Hour2 This week, a radio adaptation of Drone Nation, the last part of Scott Noble's Counter Intelligence film, which begins by noting that the under the NDAA, the US president has claimed the power to kill anyone, any time, without notice. It traces the logic back from US drone attacks which trialled the same amorality abroad, but notes that US skies are increasingly populated by drones from the FBI, Police Forces or other government agencies. Next, a talk by Medea Benjamin, author of "Drone Warfare: Killing By Remote Control", followed by a keynote speech from Glenn Greenwald at a Civil Liberties conference. This week, the final part of our radio adaptation of 'Scott Noble's film, entitled "Drone Nation". It looks at the multi-billion dollar bu$ine$$ of raining down death on the other side of the world, and how the same amorality of drone strikes has come home to roost in US, with the NDAA codifying the right of US presidents to kill anyone for any reason, or for no reason at all. Far from reducing terrorism, the US use of drones is increasing the terrorist threat, which makes good business sense for the so-called 'anti-terrorism' industry. 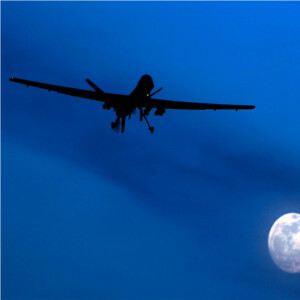 The film reports on the rapid expansion of drones and their capabilities and uses. Robert Steele that there is an urgent need for a "truth and reconciliation commission" for the elite who have exploited not only the poor of USA but large parts of the third world. The film draws on a range of interviews from ex-insiders such as Ray MacGovern, Philip Agee and John Stockwell. Next we hear a talk by Medea Benjamin, author of "Killing by Remote Control", given to Code Pink in San Jose, on 2012-06-25. As well as looking at the devastating effects of being subject to drone attacks, she looks at the political uses of drones in USA, noting that whilst a majority of the US population are against the ongoing war in Afghanistan, 80% of them don't see a problem with the use of drones for killing "terror suspects" without trial. Israel, she notes, is the world leader in the drone business, selling 85% of the world's exported drones. We conclude with about 2/3 of a keynote speech given by Glenn Greenwald on the systematic violation of the rule of law to the 2012-12-08 conference on Civil Liberties entitled An Injury to One is An Injury to All:- A Conference in Defense of Civil Liberties and to End Indefinite Detention. Whilst not himself abandoning faith in the institution of law, lawyer Greenwald notes that there is scarcely even pretense nowadays from the US government that they are acting within it. Thanks to Scott Noble for the film, Counter Intelligence. This episode rebroadcasts content from 656. Episode 618 also looked at the "Military-Media complex" and episode 641 tackled similar topics to this episode.. This page was last modified on 17 September 2013, at 09:45.